The secular mind may encounter potential pitfalls and warning signs on approaching this music. Do we view it as sheer joyous sound, the impact of which will hit on a purely visceral level right in the gut, or do we try to make some leap of faith and seek to believe in the devotional ecstasy that courses through this astonishing record like lifeblood? Ultimately, you may find you have little choice in the matter and that the first stance will simply melt blissfully into the latter. You will believe in something by the end of listening, even if it's simply the majestic soul of a truly unique artist and, yes, spirit. If you don't, then you should probably start seriously reassessing the direction in which you want your life to go. As part of the extensive sleeve notes to this selection compiled from the four private press cassettes which Alice Coltrane recorded and released between 1982 and 1995, her nephew Stephen Ellison AKA Flying Lotus remarks, “..I never thought that she was trying to make a big splash in the new age music scene, you know. I just hope that when it comes to the music that if people are seeking it they could find it. It should be there for you when you need”. True words for this is music with which to fling curtains open, welcome in the light and let the sound fill your room. If you have no home or room of your own, it will fill the empty spaces which surround you and in which you don't belong as well as the empty spaces inside which don't belong to you. It will, in short, heal you. 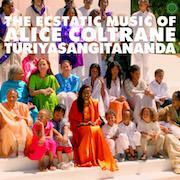 As Coltrane retreated from the commercial jazz scene in the late 1970s in order to channel her considerable energies into first the Woodland Hills Vedantic Center just north of Los Angeles, later establishing the 48-acre Sai Anantam Ashram community, it seemed that music-making also retreated into her pasts (at least, until 2004's beatific consolidation and ultimate parting Translinear Light). Yet it now seems that the music surrounded and encompassed her ever more and, indeed, progressed while she maintained the Ashram. As son Ravi says, “I'd come home from school and she'd just be sitting at the organ playing hymns and things....That's what music was for her. It was this sustenance which was part of her existence, her daily existence”. This is something which hits you at full force like waves of cosmic energy. The sonic potentialities opened up by these recordings remind me of the ecstatic keening swoop of Gaelic psalm singing as well as the choral works of Arvo Part and rejuvenation-in-bass explorations of SunnO))) and Drexciya. The latter two names crop up due to Coltrane's use of the Oberheim OB8, an analogue synth which came out in 1983. The sheer weight and density of the sounds Coltrane generates using this gear, most notably on the vast-crack-in-space-and-time ripping open intro to the truly mind-blowing version of 'Journey to Satchidananda' here, fully puts paid to any ideas you may have of this being light spiritual music. It'll elevate you but it's heavy-duty stuff, heightened further by Sairam Iyer's awestruck vocal part on the same piece. The 24-piece choir which accompanies most of the pieces here are a lightwave beam keeping the listener afloat, yet it's Coltrane's own vocals which resonate the most deeply. Her singing on 'Om Shanti' and 'Keshava Murahara' feels grounded deep within the Earth while emanating from some far-off mountain top. The delicate solo voice and harp duet 'Er Ra' is a five minute miniature of sublime translucence and tranquility. I can't help feeling that right now there may be Californian musical outfits listening to this remarkable record and trying to craft their own replication of it. All I will say is, just, please don't. I am no believer, yet when I hear these sounds, and when Alice Coltrane stamps down hard on her Oberheim pedals at 'Keshava Murahara''s end, I can feel openings in our perceived reality begin to reveal themselves and usher us forward into divine infinity. You have never heard anything quite like this. In the words of recording engineer Baker Bigsby, “...it sounds like a spaceship landing in heaven”.